"which applications do I have to package first in order to provide the most amount of users ready for migration?" These new reports put the project manager firmly in control of the user migration schedule and allow them to concentrate on the logistics of delivering the solution. It was a real eye opener to be able to go into a project the other day, analyse the data and tell the client that if they packaged the top 40 applications then 60% of their 14,000 user base could be migrated from an application perspective. This is the highlight of AppTracker’s latest features. 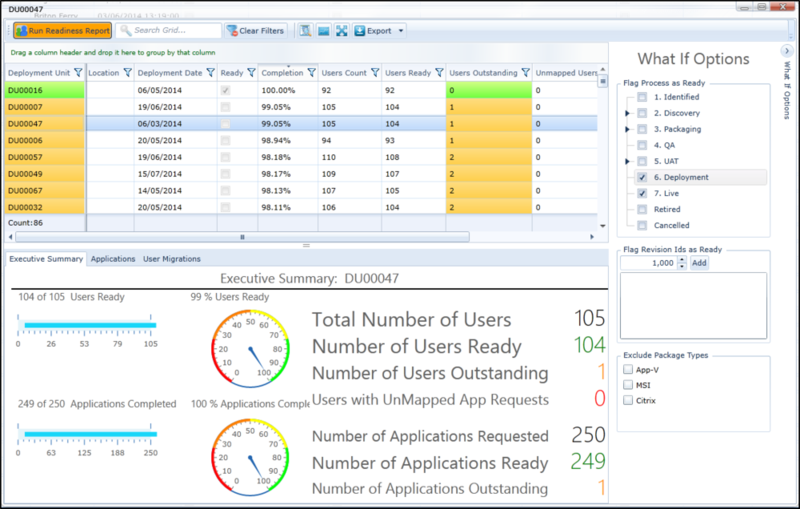 This report allows you see your current state of readiness (the blue bars) and your predicted state of readiness if you let AppTracker pick the applications to package first. By using the interactive gauges it's possible to see the effect your packaging effort will have on the overall user migration readiness. To then be able to break that data down into Blueprints (i.e. by department or geographical area) and confidently say that the Finance department will be in a position to be migrated in September is very powerful indeed. These new reports can be accessed from the Reports menu in the User Migration and Deployment Unit sections of AppTracker. This is an update to the previous User Apps Readiness Report but it now has a new layout and better ‘What If’ options so you can see the impact of packaging specific apps or whole processed of apps on your estate. Get individual Readiness of your users on a Blueprint level, see which Blueprints are closest to being ready. Get individual Readiness of your users on a Deployment Unit, see which DU’s are closest to being ready. In this post I'll cover 3 miscellaneous reports that can be handy for getting obscure information. AppTracker shows a detailed history of changes made to applications including who made the changes. The change history report shows you the changes made to a group of applications during a selected time period. This can be used to build bespoke reports not covered in the standard list. List all the applications raised in the last two weeks. List all the applications added to the UK Blueprint this month. Show all the changes made by a specific user this week. This is achieved by filtering the history to the change events that you are looking for. Applications can have different contacts attached to them, these can be for UAT, discovery, support, app owners etc. This report shows all the contacts associated with a list of applications and what type of contact they are. AppTracker’s Discovery Info tab is completely configurable by you, you can add text boxes, radio buttons, tick boxes, dropdowns … etc . If you want a report of a list of applications and some or all of these discovery options then this report will allow that. You can select all the major application fields and Discovery Info fields that you need and run the report. You’ll get back and excel style grid of the information. In this post I'll cover the two main Blueprint reports in AppTracker. When you have a lot of Blueprints and various applications in each you might want to see the process totals breakdown for each of your Blueprints without having to click them individually in the applications view. This report shows you the various process totals in each of your Blueprints and can be configured for only processes you care about. As AppTracker supports having the same applications in multiple Blueprints it can be useful to see which applications are requested the most across all of your Blueprints. This report and will show you a count of the number of Blueprints an application is in as well as the names of those Blueprints. In this post I'll cover the 4 main processes and time reports in AppTracker. These reports in particular are essential information for on time software migrations. A very powerful report showing a bar chart of the total number of applications in the various different processes over a given period in the past. E.g. it’s possible to take a Blueprint of applications and check their process totals for the last six weeks or the last six months. This can show measurable process or lack of and the need for intervention. This report builds on the process milestones report and can show you the rate of applications entering the different processes over a given period. For example this can show the rate of applications going from packaging to UAT and if it has remained constant. This is very good at measurable if SLA's are getting meet by the various teams. If you are looking for bottle necks in your workflow this report can help, it will show the total time each applications has been in its current Process / Sub Process. This can then be further filtered and sorted to highlight the applications that have been stuck for days or weeks and need to be focused on. If you are trying to identify which processes are taking the longest, get the average packaging time or find the top 10 longest applications to package then this report will give you the building blocks. It will show the total time an app has spent in each process over its lifecycle. Over the next few days I will write a number of posts on AppTracker's reporting ability. This will cover Testing reports, Processes & Time reports, Blueprints reports and other handy reports all built into AppTracker. AppTracker contains very powerful and detailed set of reports that can be used to manage a software migration project from start to finish. Our reports can be run on all applications or any subset of applications allowing you to analyse and filter the application portfolio by Blueprint, process, vendor, packager etc, or any combination of these options! There are three types of reports in AppTracker; Test Reports, Metric Reports and Inventory Reports. Provide the ability to manage the testing and quality of the deliverables within the project. This is especially useful when trying to manage the process interfaces between teams such as the discovery team and an outsourced packaging company. By managing the quality throughout the workflow it is possible to substantially reduce costs and improve productivity. Allow a project manager to see how a project is progressing over time. By providing weekly or bi weekly snapshots of the workflow its possible to see if a project or process is stalling and whether team members need to be refocused to concentrate on difficult areas. Provide the ability to extract information from the extensive application knowledge base. This knowledge base can be dynamically defined and extended by the administrator as requirements come into the project. It then becomes possible to ask questions such as "show me all the applications used by Marketing", "Show me all the applications that connect to ServerX", "Show me all applications that failed quality step Y"
All of the reports can be printed directly to a printer or exported to Excel, word CSV and other standard formats for further manipulation. The AppTracker Dashboard is the first screen that everyone will see when the open AppTracker. It shows three charts. Users can configure this view for the processes or package types they are most interested in. 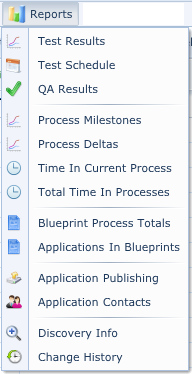 A snapshot of the current processes and the number of applications in each. A pie chart of the breakdown of application types that are in the system, e.g. msi, app-v, citrix. A progress history of applications moving through the various processes since the beginning of the project.